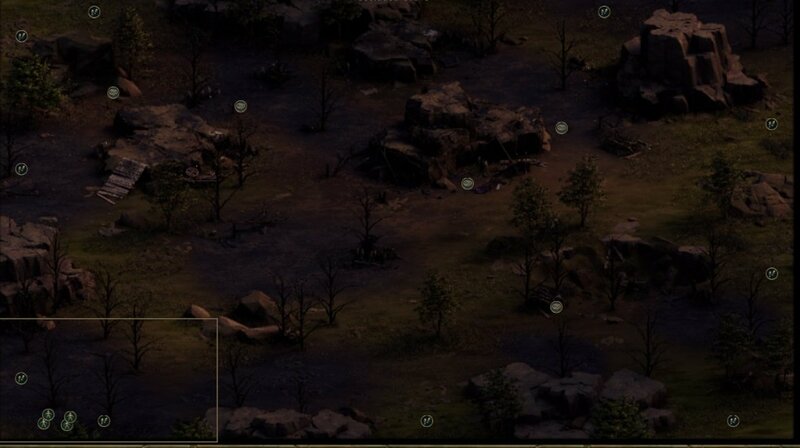 Secluded Grove is an location in Tyranny. This location only becomes available if the Vendrien Guard captains are allowed to escape the Tripnettle Wilderness and the player character has favor with the Vendrien Guard. Shortly after you enter, a scout will call to you and ask you follow him to meet with Tarkis Arris. Follow him towards the rock surface. Depending on who you let escape, you may meet Pelox Florian, Matabi Sybil, Eb and Tarkis Arris. When you first speak to Tarkis, Barik and Verse will voice their discontent. Telling them to calm down gains you average fear with both, whilst nodding subtly gains you average loyalty with Barik without actually stopping the negotiations. Attending the meeting will grant favor with the Vendrien Guard. Tarkis reveals that they didn't think they would have a chance, and that at the end of their fight they see a way to continue on through you. They also say they know about the edict, which surprises Barik and Verse. You have the option to remain silent, challenge them to surrender, ask them for a plan or use subterfuge (36) or lore (36) to propose yourself as the agent to claim the tower (+28 xp). Eb and Tarkis convey their plan: They want you to take the tower, and serve as your warriors to claim Ascension Hall in your name. You can chose to ask for why you should help, bluff about the ordeal, attack them or leave. If you agree without bluffs, the conversation shifts towards you accepting their services. Being impolite gains minor or average wrath with the Vendrien Guard, and accepting them into your service gains Eb into your party. Lantry will also give you average loyalty for this choice. Verse will not care, and Barik will lose average loyalty and gain minor fear. You will now return to the Disfavored Camp to sow discontent amongst the Archons or join in their tasks.